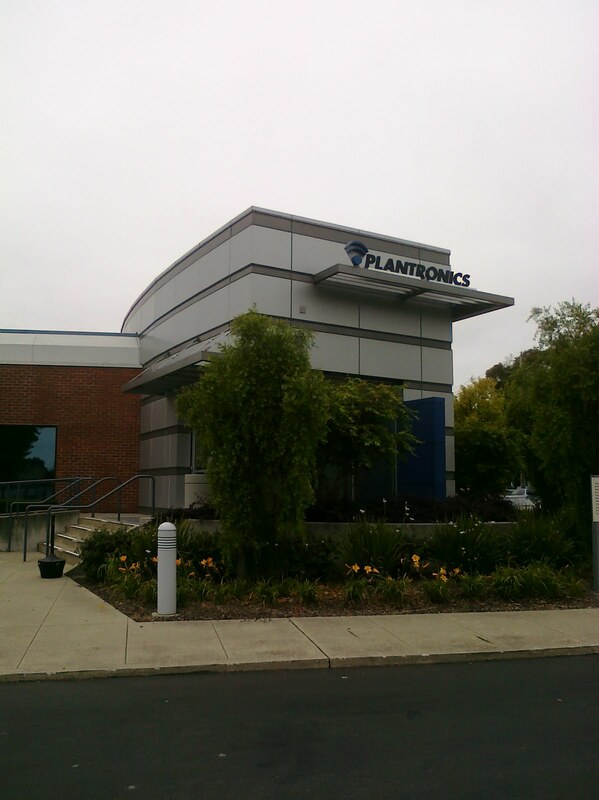 Plantronics (PLT) held its 2010 annual shareholder meeting on July 27, 2010. About ten shareholders were treated to tea, Peet's coffee, and bottled water. 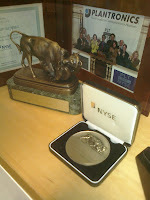 When entering Plantronics' headquarters, you will see a small (about 50 yards) museum on your right-hand side. This museum chronicles Plantronics' accomplishments since 1960, including its work with NASA and the Apollo shuttle launches. 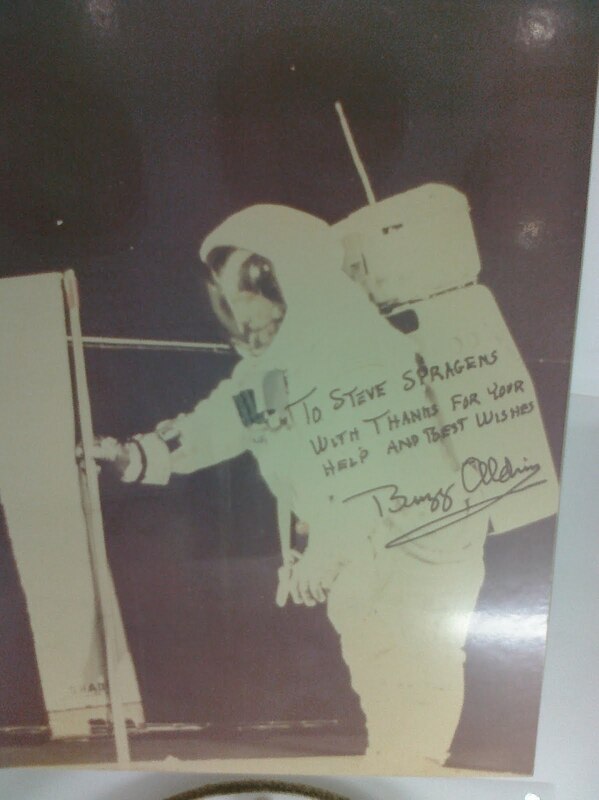 One of the most interesting museum pieces is an autographed picture from Buzz Aldrin to Plantronics' salesperson Steve Spragens. This space-age theme seems to heavily influence Plantronics ambiance--its building sections have names like Apollo, Cosmos, and Quasar. Plantronics' CEO Kenneth Kannappan delivered most of the formal and informal presentation using a slideshow. Plantronics seeks to deliver unified communications ("UC") to corporations, positioning itself as the primary communications integrator for a company. The goal of UC is to integrate a company's voice, data, and video-based communications systems. Although Plantronics creates the majority of its software internally, Plantronics works with Cisco (CSCO), Microsoft (MSFT), and IBM (IBM) to implement UC programs (10K, page 3). CEO Kannappan said he wanted to make communicating "simple and enticing" so that the return on investing in Plantronics' products would be justified. 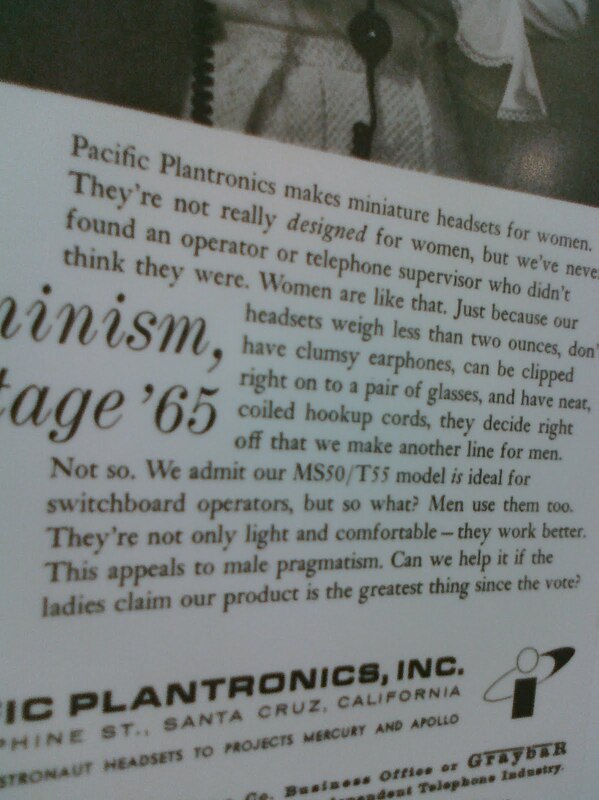 He also discussed Plantronics' focus on improving the "fidelity of the conversation." 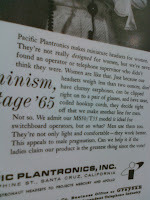 Speaking of improving conversations, Plantronics owns Clarity, which makes phones and devices for the hearing impaired. I happen to be hearing impaired, and I use a Plantronics' Ameriphone XL-50 telephone. It is a big, clunky device, but it has served me well for the past decade. Without it, I'm not sure I'd be able to run my own business as a solo practitioner. The Clarity division doesn't significantly add to Plantronics' bottom line, but it still helps--in the first quarter of fiscal 2010, Clarity contributed $4.1 million to Plantronics' overall $141.2 million. More recently, in 1Q fiscal 2011, Clarity revenue was $5.1 million out of a total corporate revenue of $170.7 million. Also, how many people would be happier with a higher maximum volume of their cell phones? I own a Palm Pre Plus (HPQ), and although I am happy with it overall, I rarely use it to talk, because its amplification isn't very high. When I was shopping for cell phones, I assumed I had no options for a good conversation and focused on comparing text messaging features. It turns out that Plantronics offers a cell phone--the ClarityLife C900--for senior citizens (a code word generally used in corporate-speak to refer to people who are hearing and/or visually impaired). It would have been nice to be able to walk into a store and try the C900 before buying a smartphone. Anyway, I'm not surprised at the lack of attention given to hearing impaired professionals--society is used to children and senior citizens being hearing impaired, but not anyone in between. How else can we explain why the recent House bill (HR 1646) on a hearing aid tax credit only covers children and senior citizens? Boo to Reps. Carolyn McCarthy (D-NY) and Vern Ehlers (R-MI). My family had to spend thousands of dollars for hearing aids when I was growing up with no government support. Now that a bill might be passed to help ease the burden of spending 3,500 to 10,000 dollars on hearing aids, the House wants to exclude hearing impaired adult professionals like me? Anyway, back to the meeting. The Q&A session was brief. Another shareholder asked, "Are you hiring?" CEO Kannappan said the company was hiring in UC, firmware/software, software support, tech support, and field sales agents, and the increase in hiring would be "gradual." I asked about Plantronics' decision to shut down and sell a 200,000+ square foot building in Suzhou, China. Plantronics had decided to move its Bluetooth headset manufacturing operations from Suzhou to Weifang, China. (See 10K, page 14.) CEO Kannappan said the new supplier in Weifang, China is in a better position to offer Plantronics "cost-savings." Disclosure: I own an insignificant number of Plantronics (PLT) shares.